Good. You've come to the right place. Join us for a no holds barred discussion of the best backpacking tents for 2019, what you should look for when picking one out, what to avoid, ​the best budget and high-end options, and a whole lot more. Now, some people go ​backpacking for a ​weekend, and then it’s back home. Others like to spend several days or longer backpacking, and it is important that they have a good shelter that is lightweight and easy to set up. The problem is, there are so many different tents available that it can be hard to figure out which is going to be best for your particular needs. We’re going to give you a rundown of the things you should be looking for in the best backpacking tents, ​including weight, design, build-quality, materials and weather protection. Let’s get started. ​If you’re just backpacking by yourself, you’ll want to stick to lightweight one-man tents, such as the ALPS Mountaineering Lynx 1-Person Tent. But, if there are going to be two or more people, you’re going to need something a bit bigger. In the case of backpacking tents, you have the option to choose one that can sleep one to four people – anything bigger, and you’re looking at the family tent category. It should have a floor area that is large enough to accommodate the appropriate number of people, and be a decent height so you can stand up inside. Finally, it should be small enough when folded to be easily carried and stowed away into your backpack. ​The next consideration is weight. Tents are being made more lightweight than ever before, making them ideal for backpacking. Many weigh less than three pounds, but still have enough room for you to be comfortable. When thinking about tent weight, the first thing to look at is the absolute minimum weight. This is the weight of the actual tent, poles, and rainfly, with no extras such as stakes and a footprint. Make sure that you look at the packaged weight, which is the weight of everything that you get in the box. The next consideration is weight. Tents are being made more lightweight than ever before, making them ideal for backpacking. Many weigh less than three pounds, but still have enough room for you to be comfortable. When thinking about tent weight, the first thing to look at is the absolute minimum weight. This is the weight of the actual tent, poles, and rainfly, with no extras such as stakes and a footprint. Make sure that you look at the packaged weight, which is the weight of everything that you get in the box. ​Next we are going to talk about the various fabrics that tents are made from. Most tents are made from either coated polyester, coated nylon, or cuben fiber. If you want a tent that is durable, coated nylon is your best bet. Look for one that is made with lightweight nylon. The weight of the fabric per square inch is known as the denier (D), and most tents range from 10D to 70D. Your tent fabric will have a waterproof coating. The most popular is polyurethane (PU), probably because it works, and it is the least expensive way to waterproof a tent. The only problem is that over time, fabrics coated with PU can lose their resistance to water. If you don’t mind spending a bit more, you can get a backpacking tent that is coated with silicone elastomer (SilNylon), which is on the higher-quality tents. It is more durable than fabrics coated in PU, and it is lighter in weight. ​In most cases, the poles that come with your tent will be good quality. Look for a tent that has poles that are lightweight and flexible. The most important feature to look for in the pole is the sections. We recommend that you get a tent with poles that fold into small sections, as they are easier to store in your backpack. Try to avoid stakes that have a hubbed design, because they have weak points at the hubs and tend to break easily. Most tents don’t come with nearly enough guy line, and it is usually of inferior quality. It is best to buy this separately. In most cases, the stakes tend to be pretty good, but there may not be enough, or you may prefer a different style. Again, different stakes will need to be purchased separately. A good rule of thumb is to have four to six stakes in your pack. ​What time of year do you plan to be using your tent? If you are only planning to use it in the warmer summer months, a three-season backpacking tent is all you need. It will be a great, lightweight shelter that is designed for spring, summer, and fall conditions (not recommended for use during heavy storms). For winter backpacking and tenting, an extended-season or a four-season mountaineer tent is a good option. An extended-season tent can be used in harsher conditions, and will protect you from the snow. A four-season tent is made for the winter, and is made to be able to take a lot of wind and heavy snow. Wall Shape – Look for a tent with walls that are vertical, as this is going to give you more interior space. Rainfly – If you end up spending a lot of time inside the tent during storms, it will be brighter inside if you use a rainfly that is a light, bright color. Doors – If you are on a budget, a tent with a single door is fine. But, if it is within your budget, look for a tent that has more than one door (at least a front and back door). Vestibules – These are rainfly extensions that offer you storage space for gear so you don’t have to pile it up right inside the tent and take up sleeping space. Ventilation – Your tent should have mesh windows or panels with zip panels for ventilation. Some also have rainfly vents you can open or close for added ventilation. ​The MSR Hubba Hubba NX Tent two-person backpacking tent is made with 20D ripstop nylon, and 15D nylon mesh. It weighs just three pounds, and it is fast and easy to set up - the parts are all color-coded, making this tent super-easy to set up and tear down. It also has External Guy Out Loops which help to ensure stability even in windy conditions. There is plenty of head and elbow room, and there are two large, StayDry doors that have rain gutters built in. The doors are made so you can enter and exit the tent in the rain without getting water inside the tent. However, we’ve heard reports there may be an issue with occasional leaking through the flooring, but a footprint can alleviate this problem. The DAC FeatherLite SL poles are made from lightweight aluminum, and the hubs are super-light and join the poles to make one pole for the entire tent. There are also two large vestibules on the sides where you can store your gear to keep it out of your way. ​The ALPS Mountaineering Lynx is a one-person tent that is ideal for backpacking – it weighs just 3.94 pounds, so it is easy to stuff into your backpack and take anywhere. Plus, while it does come with stakes, the Lynx has a freestanding design, so you don’t always need the stakes and can travel lighter without them. It has awesome ventilation (the half-mesh walls really help), and it is easy to set up. It has just one door with an easy entry, as well as a vestibule where you can store your gear. This is a good all-weather tent, with a factory-sealed fly and floor seam for protection against water leaks. Its Polyester Fly is resistant to damage from the sun’s UV rays, and it will stay taut and not slacken. ​The Big Agnes - Copper Spur Backpacking Tent is made from nylon, and has a single door. The two-person model has a single door and vestibule, and the larger models have double doors and two vestibules. The inner tent is from a breathable, lightweight mesh made from polyester or nylon (fabric depends on the tent model), which provides you with plenty of ventilation. It also has a vestibule for gear storage, and there are storm flaps on the vestibule zipper. It has a steep wall construction, so you have more interior space, especially when you want to stand up. There are even media pockets, which are located right over the sleeping area, where you can keep your iPhone and route the ear bud cord through. The guy line and tent corners are reflective, so you can easily see the tent in the dark if you have to go outside for any reason. For more info on the Copper Spur, check out this indepth review of the Big Agnes Copper Spur UL3 mtnGLO. ​The Kelty TN2 Person Tent has a floor area of 27.5 square feet, and a vestibule area of 10X10 feet. The packaged weight is just under five pounds, making it easy to carry while you are backpacking. You won’t disturb anyone in the tent if you have to exit, because the zipper is quiet. Plus, you can put this tent together in less than 10 minutes (less than five minutes once you have done it a few times). This is a freestanding design, so there is no need for stakes to hold it down. It has a Tent Cube storage system, and has taped floor seams with mesh wall panels. Enjoy plenty of ventilation with the mesh wall panels that let just the right amount of air in. There are also internal storage pockets for storing smaller items, and a stargazer fly so you can lay inside and watch what is going on overhead, day or night. ​Not only is the Marmot Limelight 2 Person Tent is lightweight, and comes with accessories you don’t always get with other tents, including a gear loft and a footprint. You can set this tent up in just a few minutes, and the fly can be used with the footprint. The DAC poles are study and lightweight, and they are color-coded to make setup quick and easy. It has a 32 square-foot interior, and a nine-foot vestibule for storing your gear. In addition to the storage vestibule, there are also plenty of storage pockets for smaller items. The door is D-shaped, and the zippers are not only silent, but they also won’t snag. This tent has waterproof window construction, as well as a waterproof floor and a full coverage fly. Find your tent easily at night thanks to the various parts of the tent that are reflective. ​All of these tents are great, but our favorite pick is the MSR Hubba Hubba NX Tent. We love how easy it is to set up, and its freestanding design is ideal for all types of backpacking trips – there’s plenty of room for two people to sleep comfortably and lots of space for your gear. ​Thing we're done? Think again! There were two tents that didn't make our Top 5 best backpacking tents for 2019 - but we're generous folk so let's take a look anyway. When you need to be able to set up a tent in a hurry, the last thing you want to worry about is one that has a double-wall construction. But, at the same time, you also want to know that a single-wall design is going to protect you from the elements, and that is going to be large enough to accommodate at least two people. We know exactly what you mean, and we have a found a tent that we think will meet all of your requirements, and then some​: meet the Sierra Designs Lightning 2 FL Tent. ​Height – This tent is six feet high, so you don’t have to crouch over while inside. ​One Pole – There are just three poles for this tent, and they all connect together with swiveling hubs, so technically, there is only one pole to worry about. ​Easy Set-Up – Setting up this tent is fast and easy. Attach the poles externally with the quick clips, and it all comes together at a ball joint. ​Large Entry – You don’t have to stoop, as the entry is 6’3” high, and wide enough for two people to stand side by side. ​Closets – Keep your gear out of the way with closets that you can access from inside or outside of the tent. There is one on each side, so both of you have storage space. One of the coolest things about this tent is its design, which is rather unique when compared to other two-person tents. You have the option to stake it down with DAC J stakes, or use it as a free-standing tent when you are in a rocky location where you can’t drive the stakes in. Let’s take a look at the main features of this lightweight tent. As we already mentioned, this tent weighs a little over three pounds (3.7 pounds to be exact). So, if you are going to be backpacking, this might be a good option for you, especially if you’re taking on a thru-hike.. The body is made with ultra-lightweight, 20-denier nylon, No-See-Um ultralight mesh, and the floor fabric is 40-denier Ripstop 238T, PU 3000 mm, FR nylon. Another thing that makes this tent ideal for backpackers is its size. It is plenty large enough to accommodate two people, measuring 86 inches long and 56 inches wide in the front and 44 inches wide in the rear. It has an interior area of 30.5 square feet, and the internal height at the peak is 42.5 inches. There is a 15-inch overhang, and the awning height is 36 inches. Now, you might think that a tent this large would need a huge bag – but because it is so lightweight, it can be easily folded up so it is compact enough to fit into your backpack. This tent may be made with an airy mesh nylon fabric, but this doesn’t mean that it isn’t waterproof. You can even set it up in the rain without getting wet, thanks to the hybrid double and single wall construction. The fly stays on the top while you are setting it up. Even though it is a lightweight design, it is durable enough to stand up to wind and rain. If you want to watch the view without getting wet, there is an awning rather than a vestibule, so you can sit comfortably in the rain. If you do find yourself getting cold, the Lightning 2 door has a mesh upper, along with a fabric panel that you can cover it with to keep the wind out. Or, you can open the door and foot area to vent the tent and create a nice cross-breeze. You can even protect your gear from the elements, without having the take up room inside the tent. The two zippered side areas act as closets. There is one on each side, so two people can have their own space for their gear, and not have to crawl over top of the other in order to get to it. The Lightning 2 is made from lightweight yet durable materials. We love the look of this tent, and the unique design offers features that you don’t often see in other tents, including the side “closet” sections. You can pretty much stand up while inside, and there is plenty of room to move around. We love that the design makes this tent easy to set up in just a few minutes. The poles are made from high-quality aluminum, and the fly is made with a 20-denier polyester ripstop that has polyethylene coating, making it more UV-resistant and less stretchy than nylon. The sturdy stakes are made from 7001 aluminum, and there are also four guy lines for added security in windy weather. We have compared the Lightning with a couple of other popular tents to see how it stacks up. 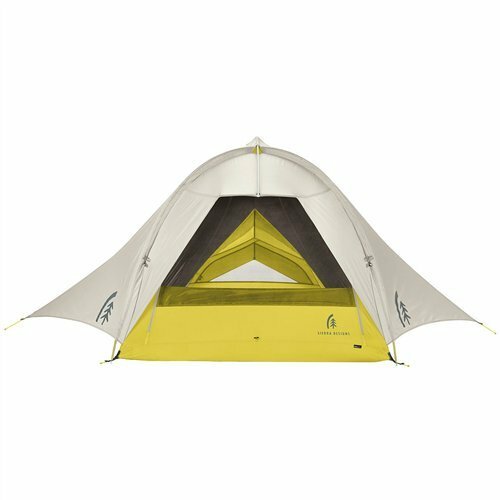 First we looked at the Big Agnes Copper Spur UL3 mtnGLO backpacking tent. This is another lightweight tent, but it seems like it is not nearly as easy to set up as the Lightning. Also, the Big Agnes tent has no closets for your gear. We also compared the Lightning with the Kelty TN two-person tent. While the two both seem lightweight and easy to use, the Kelty tent looks like it would be a lot more difficult to get in and out of, because you have to crouch over. If you are going to be doing any amount of hiking and camping, you need a tent that is going to have plenty of room, and one that is also lightweight and easy to set up. The Sierra Designs Lightning 2 is definitely an option for you to consider, because it meets all of these needs, and then some. ​Our second Bonus Review of the best backpacking tents for 2019 takes a thorough look at the Alps Mountaineering Tasmanian 2. ​It's a firm favourite here at =ZIP= and for good reason - it's built for easy use and easy entry, is durable, and has good weather protection too. Let’s take a closer look! Let’s take a closer look at the key features which the Alps Mountaineering Tasmanian 2 Tent brings to your camping trip. This tent features 2 doors, one at the front and one at the rear. This makes it convenient for two people because one does not have to go past the other to get in or out. The doors both feature zippered mesh windows. You can unzip the windows for some great ventilation and views, or you can keep them closed for those windy and rainy nights. The Alps Mountaineering Tasmanian 2 Tent features an easy-to-set-up free-standing pole system. One person should be able to set this tent up in under 10 minutes without any difficulties. The polyester rain fly which is included is water and UV resistant, plus good for wind protection too. You get 2 vestibules for storage space, which is always convenient. The Alps Mountaineering Tasmanian 2 Tent is built to be big enough to fit 2 people with ease. This tent comes with storage pockets and a gear loft, so you can keep your most important items safely in the tent with you. The bright orange coloring of this tent ensures that people can always see you when they need to. We like the fact that the Alps Mountaineering Tasmanian 2 Tent is lightweight. The whole thing weighs only 7 pounds, which is about as lightweight as a tent of this size can be. We like this because it makes it easy to carry around from one campsite to the other. It won’t add too much weight to your pack, something that is always quite convenient. When it comes to weight, this tent is about as good as it gets. 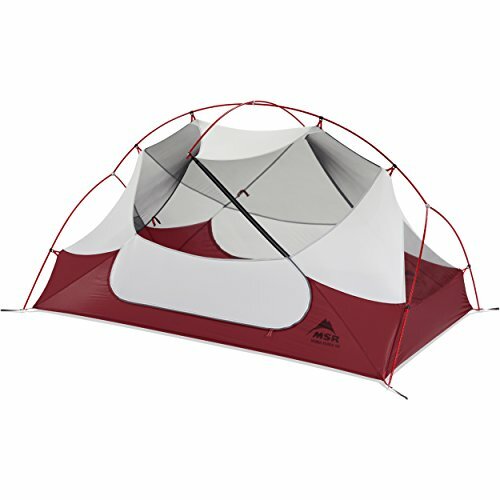 ​The Alps Mountaineering Tasmanian 2 Tent comes in at 5’2 x 7’8 x 3’10. Therefore, this tent can easily fit 2 people. It makes for an awesome one-person tent, a good two-person tent, and could probably even fit 3 children with ease. The total square footage is 34.5 square feet, which is pretty decent no doubt. It is even big enough so that you can get changed comfortably inside of it. The Alps Mountaineering Tasmanian 2 Tent comes with pretty good weather protection. The material is made to be water resistant to keep rain and wind out, plus it is also UV resistant for those sunny days where you need some shade. The mesh windows can be zippered shut for added protection from the rain and wind, which is always nice. The Alps Mountaineering Tasmanian 2 Tent also comes with a water-resistant rain fly, but it is only water resistant, and not waterproof; there is a difference. In terms of ventilation, the Alps Mountaineering Tasmanian 2 Tent is a good choice in our opinion. It comes with 2 zippered mesh windows that can be opened up at each end for great airflow. When you don’t want much ventilation and want to keep wind out, you can always close them. We do also like how the Alps Mountaineering Tasmanian 2 Tent comes with vestibule and storage areas for all of our storage needs. Also, the dual doors help make things a little easier, so you don’t have to climb over your partner when you want to exit the tent. Overall, we think that the Alps Mountaineering Tasmanian 2 Tent has a great design. When it comes to durability, the Alps Mountaineering Tasmanian 2 Tent is pretty decent. It is made with fairly high-quality materials, but they are not the best in the world. While this tent can stand up to a decent amount of punishment, it is not the strongest tent in the world. You do need to be a little careful here because the stitching and the seams leave a something to be desired. Let’s compare the Alps Mountaineering Tasmanian 2 Tent to a couple of other options to see how it stacks up. 1. 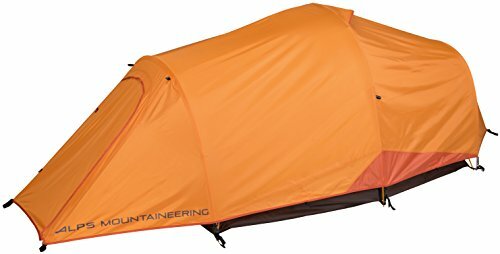 Alps Mountaineering Extreme 2 Person Tent – This tent has many of the same features as our main tent, but with some key differences. The biggest difference is that this tent is much better for extreme weather. The material it is made of, plus the advanced rain and wind tarp, both work to keep wind and rain at bay with extreme efficiency. Other than that, both of the tents are fairly similar. 2. Mountainsmith Morrison 2 Person 3 Season Tent – Both of these tents are also fairly similar. Unlike the Alps extreme tent, this one is built more for good weather. It features a lot of mesh windows to help with ventilation and to provide you with a good view from the inside. It also comes with a good rain fly, plus it has many of the same features as our main tent, but this one will not do so well in extreme weather. Base Size: 5'2 x 7'8, Center Height: 46", Total Weight: 7 lbs. 15 oz., Minimum Weight: 7 lbs. 3 oz. Previous Post How To Stay Cool While Camping (& Beat The Summer Heat) Next Post How Long Does It Take To Hike The Long Path?